With Supreme Court pushing for BS4 vehicles and banning the existing BS3 vehicles from 1st April 2017, TVS Motor Company today issued an official statement announcing their full compliance to BS4 vehicles. TVS Motor Company is also offering heavy offers and discounts on BS3 bikes and scooters to clear their existing inventories. 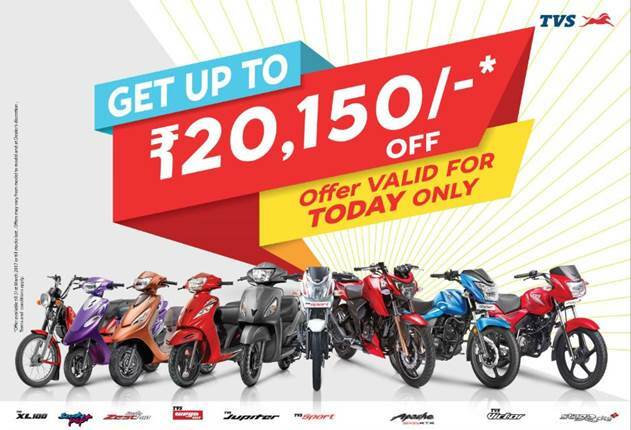 All the scooters and motorcycles from TVS Motor Company which are currently not compliant to BS4 standards are provided with huge amount of discounts upto INR 20,150. The Honourable Supreme Court has passed an order dated 29th March, 2017 stating that only vehicles, which meet BS IV emission standards can be sold and registered with effect from 1 April, 2017. TVS Motor Company is a responsible corporate citizen and is fully supportive of a better environment for our customers, and society at large. Products of TVS Motor Company are sold in over 4,000 dealer touch points across the country. All our dealers have been advised to strictly comply with the order of the Hon’ble Supreme Court and sell the BS III compliant stocks with them on or before 31st March, 2017. TVS Motor Company is fully geared up to meet the new emission guidelines and had already commenced manufacture and sale of BS IV compliant vehicles to the dealers. Get a BS4 Bike for Test Drive! Provide your details so that we can arrange test drive of BS4 Compliant AHO bike for you at your city!